Though most of us have irrational fears of something physical (ask me sometimes about my “relationship” with reptiles), for most of us the fear of emotional damage and threat loom larger. How much do you fear humiliation? I think Mark—and the other gospel writers as well—chooses words very carefully. In no way is he an idiot, or some kind of literary or spiritual half-wit. There’s a picture of Jesus that he is trying to paint, and he is using every available tool to work in the medium of words. 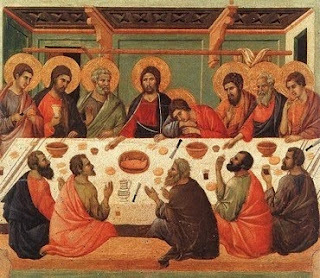 Notice how he includes the phrase, “The Twelve.” First Jesus sends two disciples into the city to find a room where he will celebrate this Passover-ish meal. Then he shows up with The Twelve. Then he talks to The Twelve. Then he says, one of The Twelve will betray him. What happened to the two? I agree, along with theologian and New Testament scholar Craig T. Evans, that the reason Mark highlights the phrase “The Twelve” in this passage is that there were other disciples in the room. They secured a “large room” for the meal: more than enough for Jesus and his chosen twelve. But a large room would be necessary to accommodate a larger group of followers. How many were there? 20? 40? So when Jesus announces that one of these 12 followers would betray him, it’s not in a private, intimate place. It’s not an aside to a camera. And Jesus just announced that they would fail; not just fail but betray. It would’ve been, to say the least, an awkward moment. But Jesus is not surprised, and doesn’t seem let it affect the moment, because he goes on with the meal. He inaugurates the Lord’s supper, and proclaims the new covenant. In spite of their coming failure. Because ultimately it’s not their mission to complete. They can fail (and fail they do); he will not. This entry was posted in faith and tagged disciples, holy week, Jesus, mark 14. Bookmark the permalink.